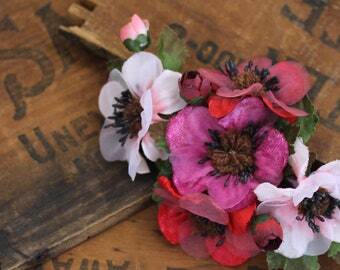 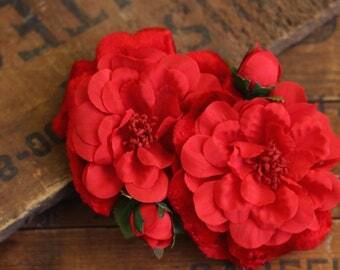 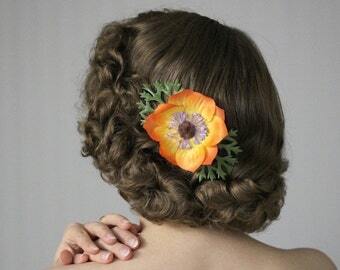 This perky coral flower for hair is made from actual reclaimed vintage millinery supply. 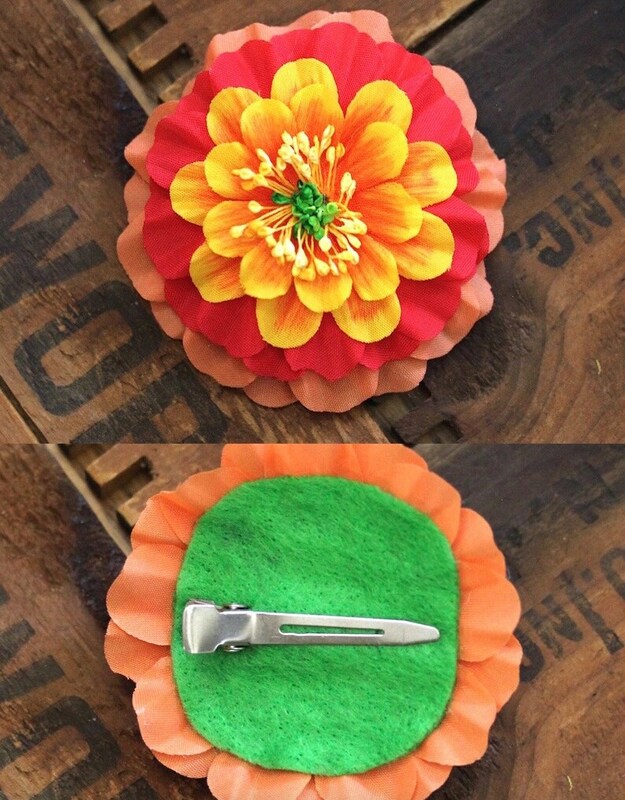 A six layer blooming marigold in the most beautiful graduated shades of salmon, coral red, yellow and orange is centered with tiny yellow and green painted plaster tipped stamens. 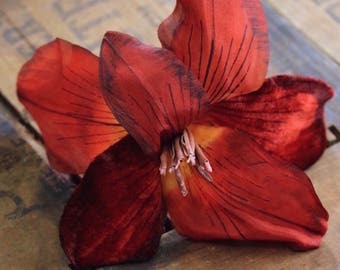 > Note: Each flower will be slightly different as these were made by hand. 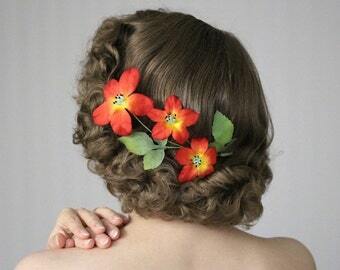 Spring Flower Hair Clip, Pansy Fascinator, Pink Floral Headband, Yellow Pansies Headpiece, Womens Hair 1950s Vintage - "Spring's Sweetheart"
Small Floral Clip for Women, White Flower Hair Accessories, 1950s Hair Band, Vintage Headband Fascinator, Wedding - "Green Apple Goodbye"
Flower Garland for Hair, Orange Fascinator, Red Floral Headpiece Nasturtium Hair Clip, Hair Wreath Clematis 1950s - "An October Affair"
Fall Flower Fascinator, Autumn Hair Clip, Brown Floral Clip, Cinnamon 1950s Headpiece, Earthy Vintage Women Hair Zinnia - "Sienna Sunrise"
Vintage Hair Accessory, Coral Flower Clip, Pink Fascinator, Red Floral Headpiece, 1950s Hairpiece Women Retro - "Strawberry Sunrise"
Orange Fascinator, 1950s Floral Clip, Vintage Hair Clip Women, Fall Hair Flower, Orange Headpiece - "August Ablaze"
Orange Floral Clip, Hair Accessory, Tropical Flower Hair Clip, 1950s Headpiece, Vintage Hair Women - "Deep Sea Sunset"
Tropical Hair Flower, Pink Hair Accessory, 1950s Floral Clip, Fuchsia Lily Fascinator, Tiki Headpiece Hawaiian - "Lipstick Sunrise"
Copper Headpiece, Lily Flower Clip, Burnt Orange Fascinator, Large Hair Flower, Rust Red Floral Clip, 1940s Vintage - "Stars in Her Eyes"
Wildflower Fascinator, Clover Flower Clip, Ivory Floral Hair Clip, Blue Flower Headpiece 1930s 40s Womens Headband Adult - "Meadow's Memory"
Yellow Floral Clip, Orange Hair Accessory, Fall Flower Fascinator, Marigold Hairpiece, Small 1950s Mums Clip, Vintage - "A-Tisket, A-Tasket"
Red Rose Clip, 1940s Hair Piece, Vintage Fascinator, Red Flower Headband, Floral Headpiece, Womens Hair Roses - "Pocket Romance"